"An Aeggekage is a traditional Danish oven pancake, usually served as a buffet item or as a dessert for a family holiday meal. 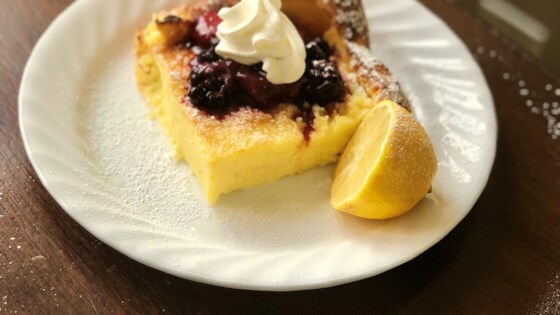 It is a light, cake-like dish that is not too sweet and absolutely delicious with fresh seasonal berries and fresh whipped cream! (Think of it as a sweetened Yorkshire pudding). Just make sure you serve immediately, this pancake does not do well cold nor is it a good leftover. But chances are you won't have any remaining Aeggekage to worry about!" Whisk together eggs, milk, sugar, and salt until smooth. Whisk in flour until incorporated, then set mixture aside and let stand for 30 minutes. Preheat oven to 500 degrees F (260 degrees C). Place butter into a 9x13 inch glass baking dish, and place into the preheated oven until it melts, then brush it all over the insides of the hot dish. Pour batter into hot baking dish and bake in preheated oven for 15 minutes. Sprinkle with lemon juice, top with berries, and dust with confectioner's sugar; serve immediately with whipped cream. A Dutch Baby brimming with berries! Tried this recipe, it came out of the oven looking great but my family and friends did not like the salty taste, guess we are just used to having pancakes made with more of the sugar than salt. Fabulous but one hint. This really rises in the oven so put it on a low rack to cook. Also great w/ carmelized apples. Fantastic! This is so great. I have spent years trying to find a recipes this good. It brings back so many childhood memories and I will make this time and time again. So pleased to find this! A childhood favorite of mine....the shape is the best part!